Figure 6. Medial longitudinal sections of tobacco seeds with enzymatic deconstruction and during germination. Three-hour-imbibed mature tobacco seed sections were treated with EBM or a buffer control prior to immunolabeling. 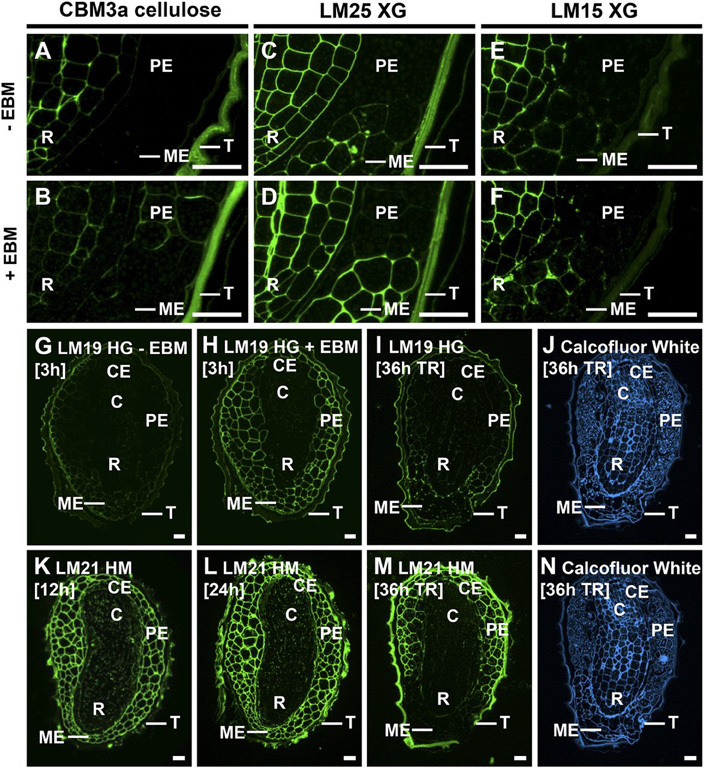 A and B, CBM3a cellulose was unmasked in PE and CE cell walls following EBM treatment. C and D, LM25 XG epitopes were unmasked in ME following EBM treatment. E and F, LM15 XG epitopes were not substantially unmasked in ME following EBM treatment. G and F, LM19 HG was weakly detectable in the endosperm of 3-h-imbibed seeds and was unmasked in all endosperm cell walls by EBM treatment. I, The LM19 epitope was unmasked in the ME at testa rupture (TR) at 36 h.
K to M, Immunolabeling of germinating tobacco seeds with LM21 HM revealed the specific degradation of heteromannan (HM) at the ME at testa rupture. R, Radicle; C, cotyledons; T, testa. Bars = 50 mm.